Featuring easy operation, pre-loaded parameters and a range of horsepower ratings, the AF-300 G11 and the AF-300 P11 are adjustable speed variable torque drives. Operation is achieved with simple commands from local or remote keypads or from facility management systems. Pre-loaded motor parameters and factory defaults are included for out-of-the-box installation. Both systems offer a range of horsepower ratings in 230VAC and 460VAC. Additional features include a backlit, seven-line display, RS485 Modus MTRU communications, energy savings mode, PID, dynamic sensorless torque vector control, and "motor friendly" soft switching IGBTs." 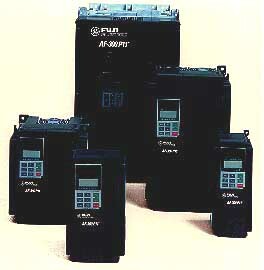 The AF-300 G11 series covers from ¼ to 450 hp. The AF-300 P11 ratings are from ¼ to 600 hp and carry global acceptance of UL, cUL and CE. The G11 is also available with an optional PG feedback card for closed loop vector control. On-line tuning provides a continuous check for variation of motor characteristics during the running of high-precision speed control. The available "Pattern Operation" allows up to seven stages of pre-programmed accell/decel and speed patterns that can be used for batch process. Th P11 can be used for VT loads such as fans and pumps. With features such as catch a spinning motor, reverse operation lockout, automatic cooling fan control, automatic restart, and tripless operation via automatic overload and acceleration time control.